The crusher-this machine is to crush the charcoal into small size or powder, can equip with a screw conveyor after crushed. Screw Conveyor-the conveyor can transport the charcoal powder into charcoal grinding and mixing machine, can save a lot of manpower. Charcoal grinding and mixing machine-the charcoal powder is very light, this machine can grind the charcoal powder to high density, and it has the function of mixing, can mix the binder with the charcoal. 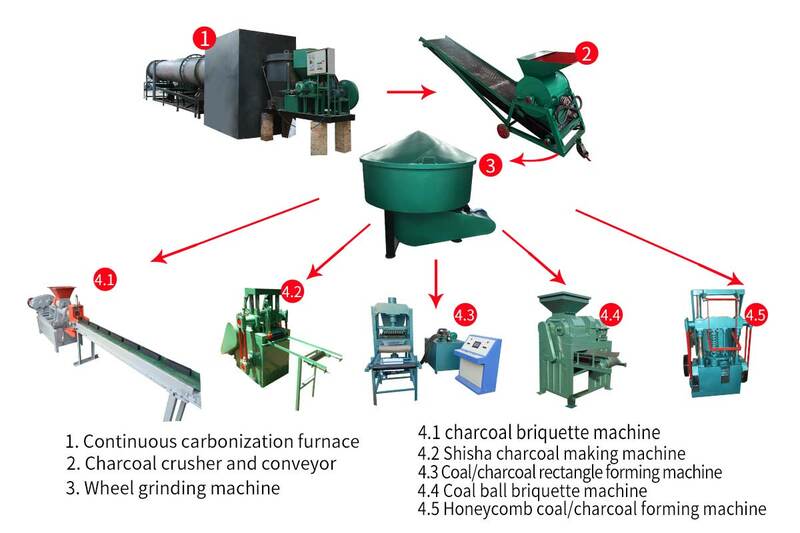 if the raw material is charcoal, this machine is the necessary machine of charcoal briquette production line. Screw conveyor-this machine is to transport the mixed raw material into a briquette machine. Charcoal briquette machine-this machine is to make charcoal powder into briquette, the briquette shape can be charcoal ball, charcoal bar, honeycomb coal, shisha charcoal briquettes, charcoal cubes. Belt conveyor-this machine is to transport the charcoal or coal briquettes into mesh belt dryer. Dryer machine-the dryer machine can dry the charcoal briquettes fast, inside is several layers mesh belt dryer, we can customize the layer and length as customer requests. In the charcoal briquette production line, the dryer machine is unnecessary, the customer also can dry the briquettes in the sunshine.